In a medium bowl, add all of the southwest sauce ingredients; whisk together until well blended. If possible, make this sauce the day before and store covered in the refrigerator overnight. The flavors will meld together and the sauce will taste even better on the 2nd day! Using a large bowl, whisk together all of the marinade ingredients. Add the shrimp and toss to coat. Set aside for 15 minutes. Brush the corn lightly with melted butter and grill until grill marks form, about 10-12 minutes. Remove corn from grill. Once cooled slightly, cut the corn off of the cob with a sharp knife. Set aside. Once the shrimp have marinated for about 15 minutes, remove from the Marinade and place on wooden skewers. Discard Marinade. Grill shrimp for 2-3 minutes per side, or until fully cooked. 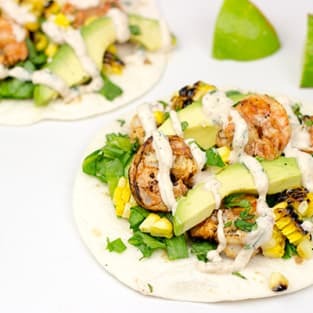 Place the grilled shrimp into the flour tortillas. Top with shredded lettuce, sliced avocado, chopped cilantro, and grilled corn. Finish with a generous amount of the Southwest Sauce and an extra dash of lime juice.